Capt. John Kumiski grew up in Massachusetts and holds a Bachelor of Science degree from the University of Massachusetts. Most of the fishing he did in New England was in freshwater, a lot of it while wading or from canoes. His first job after graduation was a teaching position at an American school in Brazil. He spent four years in South America, and fished around much of South America in both saltwater and fresh. 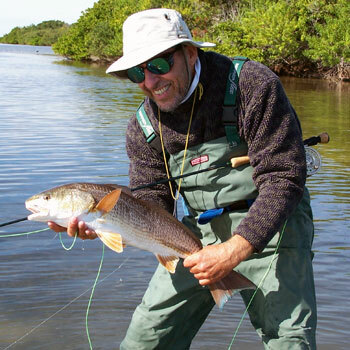 John Kumiski has fished for redfish for over 20 years and has guided them for the past 10 years. John has researched redfish in great detail and shares his secrets on catching the big ones. He's been in central Florida since 1984. He taught in the Seminole County school system for a long ten and a half years. He started writing and guiding part time in that stretch. He quit his teaching job in 1995 and started guiding and writing full time. He's written eight books and parts of several others and had hundreds of articles and photos published. John started tying flies as a child and has been fly fishing since about age 12. He has caught fish in 17 states and ten countries on three continents (not nearly enough of either. So many fish, so little time...). His life list on fly currently contains 60 species, again, not nearly enough. He continues to work on it. Everywhere his fishing, writing, and photography take me he learns new things that make him a better angler, guide, and writer. River Guides Association has currently allowed him to be their president. Nine boats of various types call John's yard home. Two teenaged boys, two cats, and a wife call his house home. Some of the things he and his family enjoy together besides fishing and its related activities include music, mountain biking, paddling, hiking, and reading. In spite of its us and downs (or from a philosophical viewpoint perhaps because of them) life truly is great. And you can imagine that after 14 years in a classroom John really, REALLY loves his work! For more information on his charter operations and books visit the Spotted Tail Fishing Charters website.